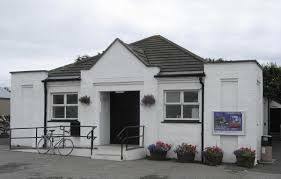 ​The Cinema seeks to serve the people living in the Machars of Wigtownshire and surrounding areas. It is run entirely by volunteers as a not-for-profit organisation. We use high resolution equipment and tiered seating for part of the room, which is put up before each screening. We screen fortnightly from September to April each year. The bar is open for drinks, teas and coffees before performances. Ok let's be honest! So we don't have the most comfortable seats, but we have loads of cushions or you can bring your own or a folding chair to make you more comfortable! Twice in our film season we hold very popular Theme Nights with outside catering from Caroline McCornick. Guests arrive at 6pm to enjoy the bar and get settled at their tables. The meal service starts at 6.30pm and the film starts at 8.00pm.